With a massive cage surrounding the ring, it was hard for 'The Enforcer' Tim Westybrook to influence the match as much as he normally would in favour of Edd Stone. However, the door was never locked, so he could have gotten in there to beat down Aaron Andrews any time he liked! Instead, the big man opted to LOCK the Cage Door after numerous attempts at an escape and a victory by Andrews! 'The Ace' was also blasted on the top of the head BY the cage door at the hands of Westybrook at one point. Westybrook then used a chain and a padlock to keep the competitors in the cage! Late on, Andrews tried to open the door and squeeze through the gap that the chain allowed for, but he couldn't get through. On the other side of the ring, Edd Stone threatened to climb out over the wall, with Westybrook stood ready to catch his leader! Andrews got free of the door and raced over to stop his rival. The two men sat atop the cage wall, trading punches and forearms, before Edd fell and landed hard between the cage wall and the ropes!! Westybrook's demeanour changed now, and he told Andrews in no uncertain terms: NOT to jump! But 'The Ace' didn't listen to the big man, and leapt into his arms with a beautiful flying body press. Winning the match via Cage Escape!! Newcomer Wade Orson has been purposefully built up slowly as a competitor in Canada. 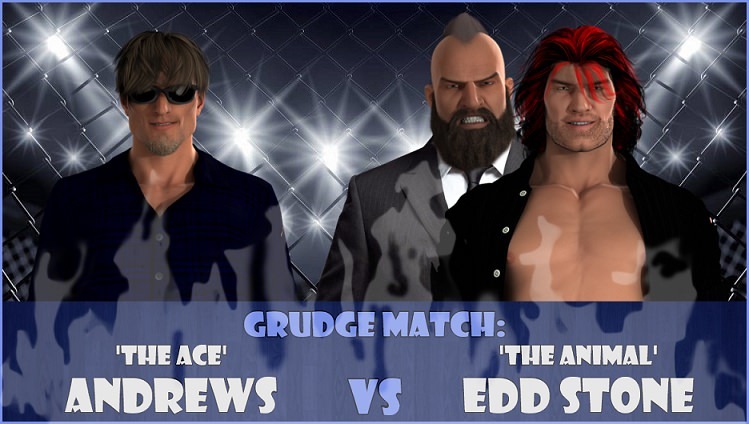 He began with a rivalry with Lord James King, and has since battled POISON a few times, but he's still adjusting to life North of the Border, so he needs to find his feet a little before he's unleashed on the rest of the roster. For POISON, it's arguably the same since returning from a serious concussion. 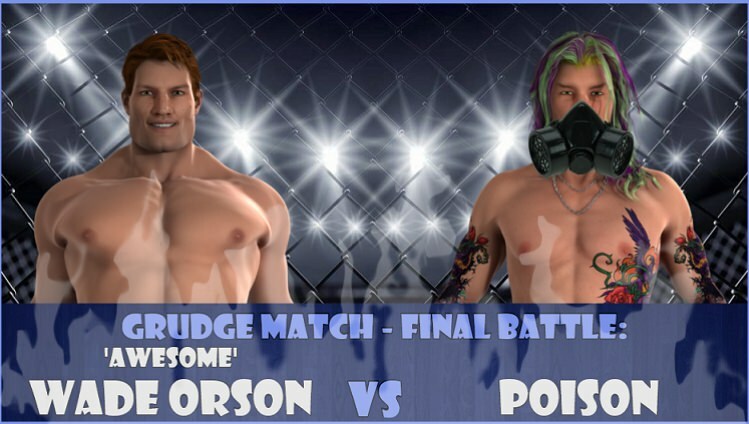 Slightly away from the Main Event rivalries, this feud has centred around one attack from POISON on Orson on the night POISON return to the company! Since then, Orson has beaten POISON, TWICE on pay-per-view. At Summer Smash, and then at the recent Scramble event. For the finish tonight, much like in the first match, we had both men sat perched on the top of the Cage wall, ready to fight until one fell back into the ring. POISON had the advantage, being right handed. Orson had to use his left for fear of hitting POISON so hard he fell out of the cage to the floor! POISON was knocked backwards at one point, and seemed to grab at his face inexplicably. He then leant forwards and sprayed the 'Green Mist' into Orson's eyes!! Orson was blinded and couldn't tell where he was! He also didn't see POISON slowly and arrogantly climb down out of the Cage to score the upset win! 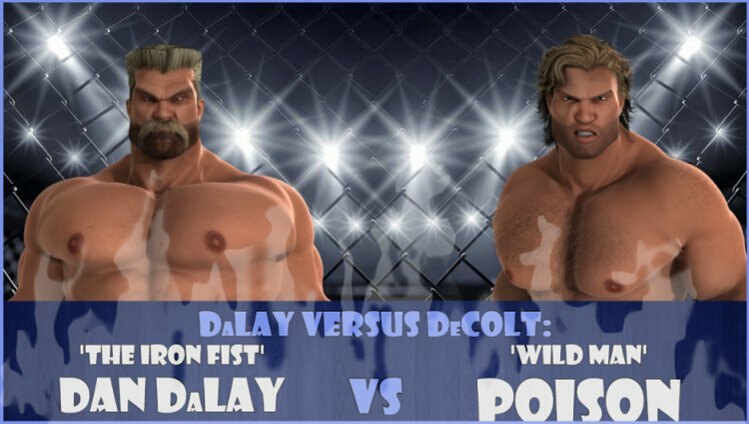 The following match saw 'The Iron Fist' Dan DaLay taking on 'Wild Man' Jack DeColt... Their feud has recently been re-ignited in NOTBPW, after years of battling it out in CGC... It's all down to the big reveal of Alex DeColt's big secret: That he has a SON called Logan, who was Fathered by Alex at just 18 years old... and mothered by Dan DaLay's sister Romy... Who was also just 18 years old... The reveal has caused a rift between the DaLays and DeColts, and we as yet don't know where Logan's loyalties will land him... Will he side with his mother Romy, his uncle Dan and his cousin Robin DaLay, who he has formed a decent young tag team with...?! Or will he choose to follow his father Alex DeColt, who just so happens to be his boss, and one of the best wrestlers in the history of Canadian wrestling...?! A man who didn't care he even existed until recently...!! 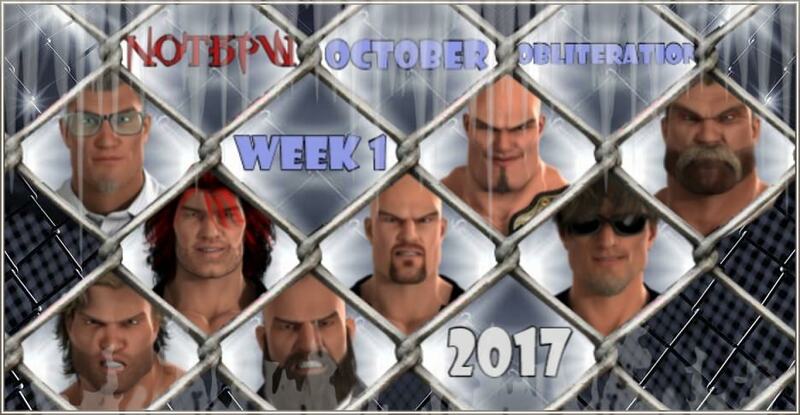 With the cage now returning high up into the rafters, it was time for our next match. The youngster known as 'Logan' HAD to be watching this match unfold from the back, and if he was, he would have seen a thrilling encounter between two men who know what they're doing out there! Dan DaLay looked to out-muscle his opponent, and use his 65lb advantage to try and overwhelm Jack DeColt. But as soon as things got a little stretched late on, Jack came into his element, and began delivering brutal punches and kicks. The brawling 'Wild Man' even delivered a brutal headbutt to DaLay's nose, causing the veteran to bleed and look in a bad way! For the finish, DaLay missed a clothesline in the corner of the ring, and clattered into the turnbuckle pad nose and face first! As he staggered backwards and turned around, Jack DeColt couldn't believe his luck, and he planted his rival with an 'End Of Days', before pinning him! 'The Alliance' of Thrill Seeker and Trent Shaffer makes a lot of sense. Both are solid and consistent, and very well respected in-ring performers who plied their trade in CGC before making the move to NOTBPW in 2016. 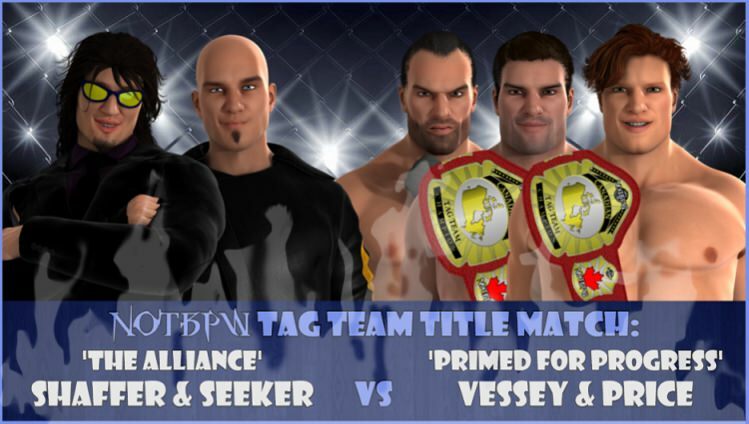 Seeker has had a number of successes as a tag team with Jacob Jett, while Shaffer became NOTBPW Canadian Champion just four months after signing with the company! Standing in their way tonight though, were a motivated and ruthless duo on Cameron Vessey and Christian Price. The two young studs are no strangers to Thrill Seeker, and made it their mission to send him to the same injury shelf as his tag team partner: Jett! But Seeker is resilient, and he fought hard in there to get the tag to his teammate Trent Shaffer. When the 32 year old exploded into life, the momentum swung significantly in his teams favour. However, the two fan favourites were always outnumbered, and Bryan Vessey made all the difference with a distraction to Thrill Seeker late on. It allowed Cameron Vessey to push Seeker out through the ropes. This prompted a high kick to Cam Vessey's face from Trent Shaffer. Which in turn allowed Christian Price enough time to line up and land his 'Stud Stopper' Stunner finisher! 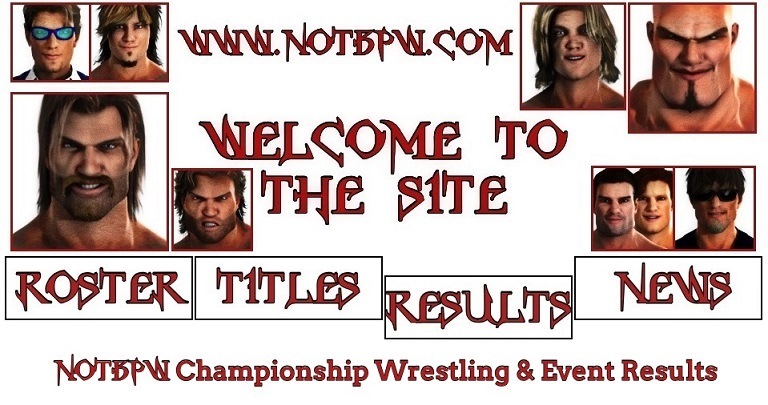 A 2 out of 3 Falls Match was the stipulation selected by the challenger: James Hernandez for his re-match for the NOTBPW Television Championship. Hernandez lost 3-0 in a Scramble Match at The Scramble last month, to his opponent tonight: Sonny Wildside. Yet he still felt this was the right stipulation to choose. Wildside has mocked Hernandez for his selection, but has said that he respects 'Mr. Mainstream' for his lack of 'Fear' in choosing a match stipulation like this. Wildside has however, said that Hernandez should have chosen a stipulation which favours a 'fluke win', because that's all Hernandez can realistically hope for. Wildside's comments in recent weeks had clearly angered Hernandez, because he came out of the blocks fast in this match. He was aggressive, and consistent in his attack on Wildside's lower back and kidney area. He picked up the first fall of the match in under 10 minutes, after cutting Wildside down with his 'Apparition #14' Spear! Wildside landed hard on the small of his back, and the referee had to give him a minute to recover. 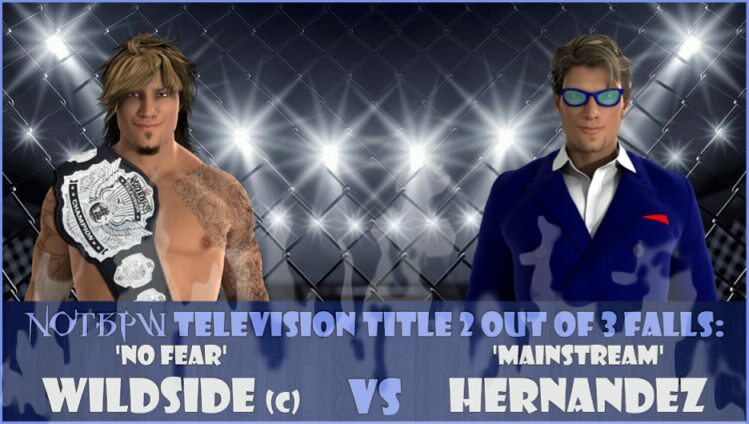 When the referee deemed Wildside fit to continue, Hernandez sprung into life, looking to hit a second Spear. But Wildside leapfrogged over it, and the fired up Hernandez hit the corner buckle. Wildside got a 'fluke' roll-up, and managed to pin Hernandez to even things up! From then on, determined not to make a mistake, Hernandez was slow and methodical. But the usually cool, calm, and collected Hernandez was angered once again moments later, when Wildside attempted another roll-up! Hernandez kicked out at 2, and then kicked Wildside on the bridge of his nose! Wildside was losing blood now. Not a lot of blood, but enough for him to notice it, and it suddenly became a fight, not a wrestling match. It seemed like both men were handing out receipts for stiff shots left, right and centre. For the finish, it was Hernandez's ribs that were the difference, having been worked on for a few minutes. Wildside hit a front suplex onto the top rope, and Hernandez's mid-section was in real trouble. A stomp from the outside in, and then a Spear of his own were enough to score more near falls for the NOTBPW Television Champ. In the end though, the 'Fear Factor' sealed Wildside the win, just like it has on countless other occasions throughout 2017! We cut backstage after the excellent NOTBPW Television Title Match, to where a fight was being broken up by officials and wrestlers...!! Ernest Youngman had apparently shown up and jumped his now former? 'mentor' Sean Deeley...!! Dean Waldorf and Marv Statler were trying to hold the two warring Shooters apart, as were other wrestlers and referees who were nearby... In the end, Deeley delivered a thumb to Youngman's eye while the youngster was being held, and the Shooter strolled off arrogantly... He shouted that Waldorf and Statler should follow him, but they didn't know what to make of the entire situation, and the camera feed cut away before we could see if they did...!! 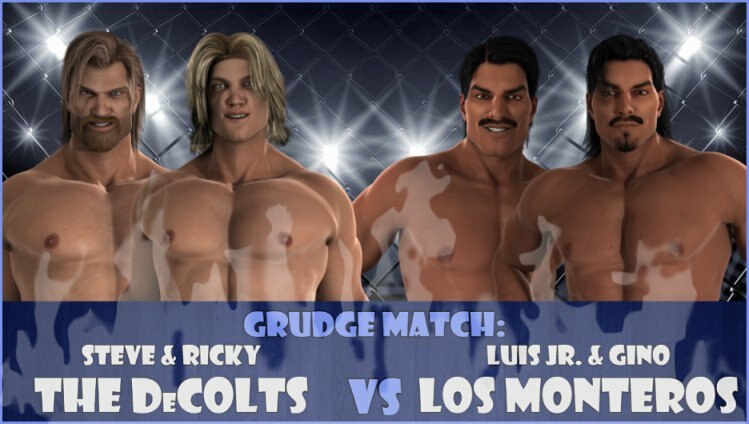 Even at this early stage of Luis and Gino Montero's NOTBPW careers, it is clear that they aren't afraid to get in the ring with anyone. They challenged the legendary DeColt Family to a match tonight, and a match is what they gave them! Steve and Ricky DeColt are well-travelled Canadian megastars, and NOTBPW is now their home. The Mexican duo of Luis and Gino Montero have only been here a couple of months, but they fought like they owned the place! Ricky DeColt was isolated for a long time, before he was finally able to tag in his older Brother Steve (DeColt). Steve was welcomed into the match by some stiff forearms from Gino Montero, but 'The Outsider' soon took him down and began pounding him into the mat with fists and elbows! Luis Montero Jr.' jumped in at this point, but Steve took him down too! Then all of a sudden, a man appeared at ringside who nobody expected to see arrive there: POISON!! Fresh off his victory over Wade Orson in the Steel Cage from earlier tonight, POISON stood stoic in the entrance way, about six feet from the ring. He had his 'Green Mist' dripping from his mouth and chin, as if he'd just sprayed it at someone. He was breathing heavily, and a smile crept across his face when Steve DeColt's gaze was taken by the mysterious multi-coloured veteran. Steve DeColt's attention was only on POISON for a moment though, because he was soon being attacked 2 on 1 by the Montero Brothers. They delivered stereo Super Kicks, before both hitting roundhouse kicks to each side of DeColt's cranium! The veteran DeColt brother flopped to the floor, and Gino Montero went for a cover. Ricky DeColt slid into the ring and tackled Luis Montero Jr. ONTO the pinfall attempt to break it up at 2 and a half! From then on, chaos ensued, as both teams hit double-team moves. In the end though, with POISON watching on and smiling again, Steve DeColt hit his 'DeColt Stampede' big boot to Luis Montero Jr., and then pinned the Mexican star! Gargantuan is a complex individual in many ways, but he seems to care about only one thing once the bell rings: destruction! All he wants to do, is pummel his opponent until they can't walk, and then throw them into the air and drop them across his huge, tree trunk-like knee. In this Steel Cage Match, he also wanted to use the cage walls to his advantage, and you could see him sizing Angry Gilmore up, and working out ways to use the steel! But Gilmore is a skilled and experienced competitor, and he's already had one crack at 'The Monster'. He would have learnt a lot from their encounter at The Scramble, and he set about going to work on those big, thick, legs of Gargantuan. The NOTBPW Canadian Champion didn't have an answer early on, and it didn't take long for Gilmore to take the 350lber down to his size, on the mat! Gilmore used a variety of limb attacks on Gargantuan's knees, and followed them all up with holds and submission attempts. Gargantuan managed to fight Gilmore off during all the submission attempts, and at one point kicked at Gilmore so hard that his momentum sent him through the ropes and he hit his face on the cage wall! As the match wore on, it turned into a fist fight. Although Gargantuan is bigger, and stronger, than Angry Gilmore, the former 2-time SWF World Heavyweight Champion knows how to brawl! His hammer-like fists rocked Gargantuan, and the big man didn't seem to have an answer for them either. But eventually, once again, Gargantuan used the steel cage wall to his advantage. He hoisted Gilmore onto his shoulder, and slammed him head-first into the cage! 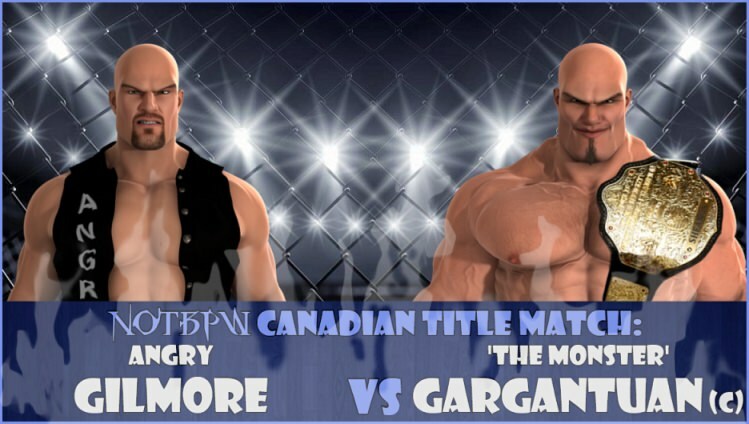 Gargantuan took a breather, but once Gilmore regained his composure, he was right back on his opponent, and had the NOTBPW Canadian Champion in all kinds of trouble. Late on though, Gargantuan once again got some help from an unlikely source, as 'Mighty' Danny Cavanagh ran to the ring, and began to CLIMB the steel cage!! Angry Gilmore cottoned on to what was happening pretty quickly, and he delivered a dropkick to the cage wall that sent Cavanagh flying backwards! Gilmore may have hurt himself in the altercation, as he caught the ropes on the way down and landed hard. Gargantuan saw this as his opportunity to pounce, and he delivered a two-handed choke bomb to the wounded fighter. Gilmore kicked out of the resulting pin, but he was only delaying the inevitable. An 'Ultimate Backbreaker' was enough to see the challenger off, and Gargantuan once again retained his Championship! Steve DeColt & Ricky DeColt [def.] Gino Montero & Luis Montero Jr.
Last edited by The Lloyd : 01-19-2019 at 12:50 PM.